Often when Google releases earnings, AdSense publishers try to extract how much share Google is paying them of the earnings. Ad you know, a publisher places an ad from Google on their site, the advertiser pays Google and then Google pays a share of that to the publishers. Looking at Google's earnings, you can somewhat figure out how much share publishers make. Always, keep in mind, certain publishers likely get special arrangements. 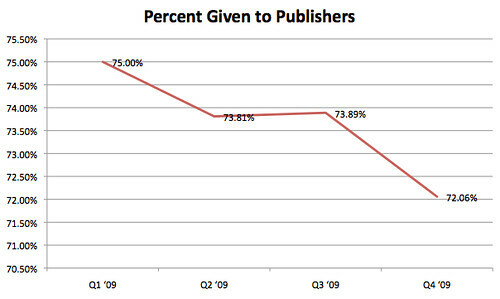 Labnol posted the latest look at this share, showing that in the first quarter of 2009, Google paid an even 75% to the publishers. However, in the fourth quarter of 2009, that share dropped to 72.06%. Update: Google revealed on May 24, 2010, the exact revenue share for the AdSense content and search network.